Eli Roth’s contribution to Grindhouse, the faux Thanksgiving trailer, excited everyone for some Turkey Day slashing. After all, nearly ever other holiday has had its…er, day in horror history, so why not Thanksgiving? 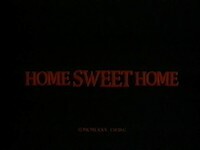 Unbeknownst to many, that was a question that was answered 2 decades earlier with Home Sweet Home. A little known slasher film from the early 80s, this one was carving up white meat and dark meat long before Roth made it a punch line. It is indeed Thanksgiving weekend, and a psychopath (referred to in the film’s credits simply as “The Killer”) has broken out of an insane asylum. After a swift carjacking, he heads to no place in particular; at the same time, the Bradley family and their friends have gathered at a swanky ranch for holiday festivities. Paths cross when the maniac arrives, and he’s hopped up on PCP to boot; needless to say, he ends up crashing the party in bloody fashion. Few films like this will ever be accused of really developing characters, and this one is no different; instead, it goes the caricature route by crafting some outlandish and absurd personalities that stand out. There are of course some bland counterparts that end up wearing out their welcome (I think Scream missed an important rule--if you want to survive a slasher, it often helps to be the most boring character), but it’s a decent assembly. A highlight is the teenage son that’s actually referred to as “Mistake,” who goes around playing his electric guitar and performing parlor tricks while wearing mime face paint. We probably spend too much time watching these people go about their mundane business, but at least most of them are memorable. Among them is the killer himself, a deranged, giggling maniac who’s brought to life by Jake Steinfeld (of “Body by Jake” fame). While he’s pretty generic looking, you can’t help but laugh at the over-the-top performance being put on here. His method of punishments are appropriately brutal, as he stabs and guts most of the cast to great effect. There's even a “head in the car hood” gag, à la Madman (which, coincidentally, was set at a “Thanksgiving camp”). When the opening credits culminate in the psychopath gleefully running a red light to plow through an old lady crossing the street, you know you’re probably in for a pretty wacky time. This is a pretty safe assumption, as once the slashing gets going in earnest, the film moves at a brisk pace; there are some expected lulls, with one coming during the last act that’s full of missteps. When our final two (adult) survivors realize a homicidal maniac is stalking them, they react with the conviction of someone who just found a fly in their soup. Then, they do what all logical people would do in this situation: sit by a cozy fireplace and hope the killer has run off in fear. It’s ludicrous, but those familiar with slashers probably won’t bat an eye. Though there’s nothing exceptional about the direction, I suppose the film does capture a nice sense of fall atmosphere; there’s howling winds and wolves in the distance, along with some nice establishing shots that properly isolate us in the middle of nowhere. Funnily enough, this one hasn’t made it home sweet home on DVD; to check this one out, you’ll need to track down the old Media VHS, which means you’ll have to crank the brightness up to 11 to see any of the darker shots (of which there are many). It was also released as Slasher in the House by a couple of other companies, and, as of now, there’s nary a whisper of a DVD release under either title. 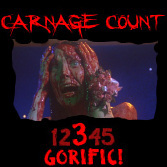 As far as Thanksgiving slashers go, this one is hardly definitive, so there’s still plenty of room on the table for Roth’s offering. For now, though, Home Sweet Home is like the cranberry sauce to accompany the robust turkey that is Madman if you absolutely must have a Thanksgiving double feature. Rent it!